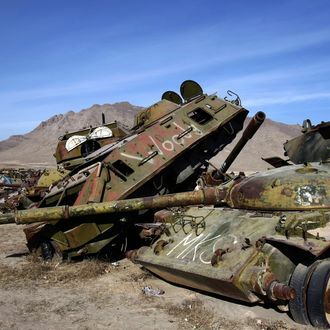 An Afghan junkyard full of Soviet tanks. The military is packing up its equipment to leave Afghanistan by 2014, and unlike the old TV you don’t want to bring to your new place, they can’t leave tanks by the curb with a Post-it that says “please take.” The Washington Post reports that military planners have determined that about 20 percent of their supplies in the country are too expensive to ship home, so instead they’re destroying $7 billion worth of vehicles and other equipment, and selling it as scrap for pennies per pound. Unlike in Iraq, they feel donating the excess supplies to the Afghan government might do more harm than good. The Pentagon is fine with our allies taking what they want, on one condition: They have to come to Afghanistan to pick it up. Unsurprisingly, there are few takers.